We changed the format this month and created a micro-lesson on video. We field many inquiries on the best method to remove that elusive hard-to-reach and barely visible burr found deep in cross-drilled holes or on a small, machined part. You know the one, the tiny particle that could tear up your entire hydraulic system should it shake loose. The lesson primarily addresses our aerospace friends who struggle with cross-drilled holes on manifold and valve assemblies. However, anyone looking for a consistent and efficient method to deburr intricate parts should find it useful. Anders and Colin reference the “feather” burr. We file burrs into two categories: rollover (or feather) and Poisson. Categorizing burrs helps us (and you) select the best method and tools for removal. 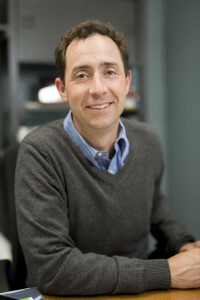 A burr created by smooshing, usually the result of a large contact force. For example, hit the edge of a piece of metal with a hammer. The thick burr that appears on the part’s edge is a Poisson burr. A burr created by smearing. Rollover burrs erupt when metal fails to fully shear away from the part during machining. A feather burr is just a small rollover burr. A few of the nozzles below were referenced in the video. 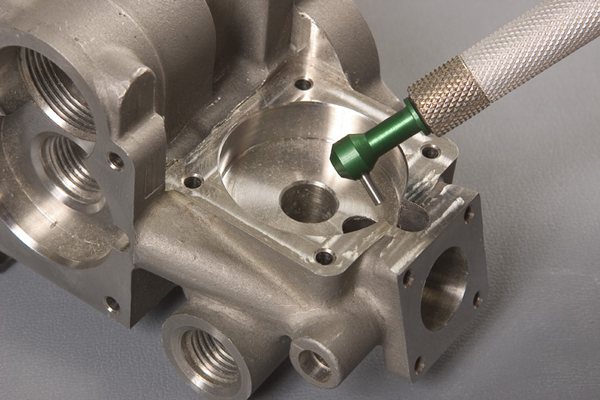 Comco designs and manufactures a wide range of nozzles, including extended and angled nozzles ideal for deburring. 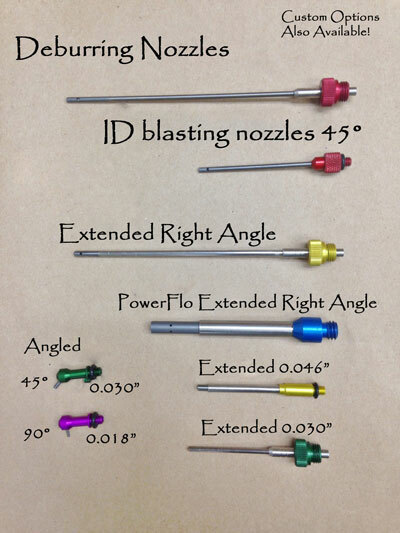 Take a look at our Nozzle and Powder Guide for a more detailed breakdown of what we have available or give us a call to ask about custom options. Click to access PDF of brochure. Extended and angled nozzles, ideal for deburring cross-drilled holes and other intricate geometries. 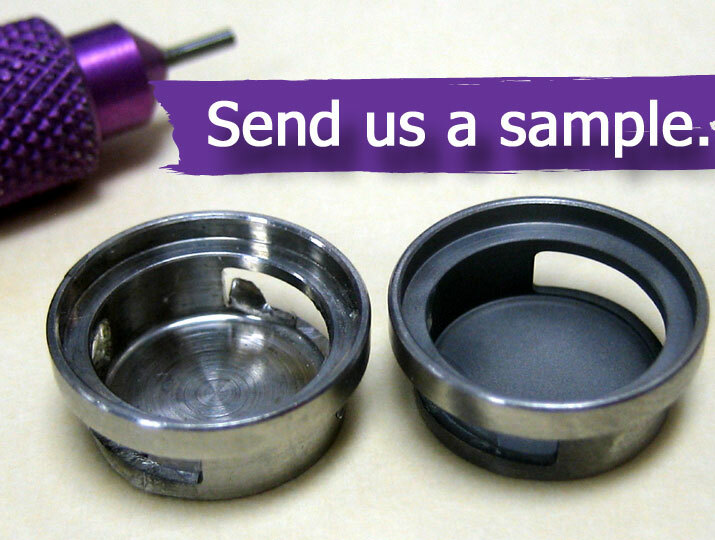 We say “send us your sample part” a lot because a sample test is the easiest way to see how MicroBlasting impacts a surface. Plus, our Technical Specialists love a challenge. If you think MicroBlasting might be a viable solution for you, email our Technical Sales team or gives us a call at 1-800-796-6626. 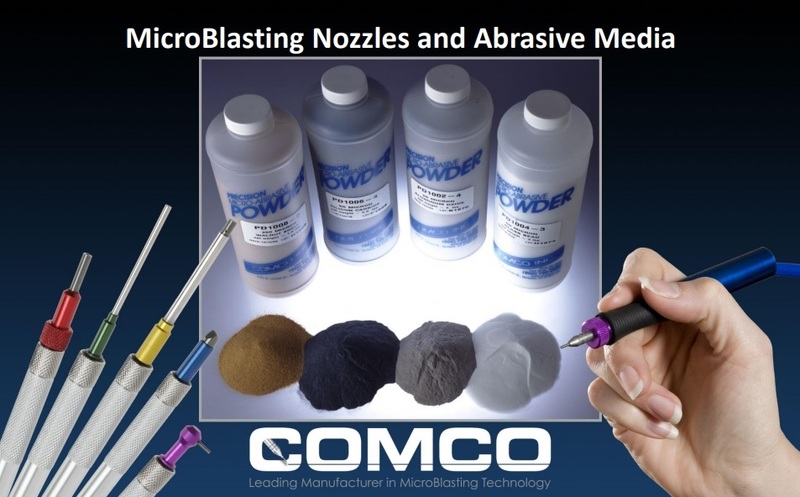 Click the video above to see deburring applications that benefit from MicroBlasting. Visit Comco’s YouTube page for more application videos.